Falkenstrom—poet, organizer, literary activist, Taiko Drummer. The vision of the Press has been to publish and promote excellent works of stunning literary value and innovation by a diversity of women, including those traditionally underrepresented in the cultural mainstream and to educate young people about the power of voice and effecting change through literary activism. Kore published Alison Deming's terse advice to Women Artists as their first publication—a letterpess printed broadside, called Girls in the Jungle, What Does It Take to Survive as An Artist. Since then, we have brought over 127 literary women into print. 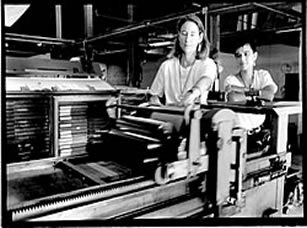 Co-founders Lisa Bowden & Karen Falkenstrom, 1993.
in the Steinfeld Warehouse, Tucson. Nov 9, 2013, The Franklin House, Tucson.